I love to make this one for my own birthday every year. Nothing else compares. The cake is buttery heavy and rich and goes perfectly with fresh strawberries and whipped cream. Simple, elegant and you just can't go wrong with a cake that grandma made. 3 cups sugar cream for 4 minutes with a heavy duty electric mixer on medium high. Beat until light, it may be longer than 4 minutes depending on your mixer. Should be a lemony light color. Bake in greased buttered and floured loaf pans at 350 for 1 hour or until the tooth pick comes out clean in the center of the loaf pans. Completely cool. Whip chilled heavy cream and sweeten with sugar (around 4 tablespoons) to taste. Slice the cooled pound cake in half. 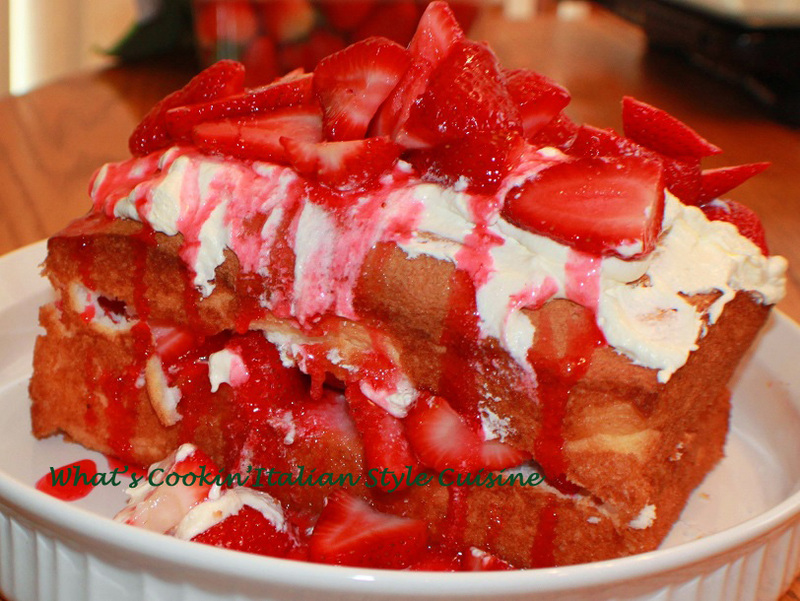 Layer with fresh strawberries and drizzle with strawberry ice cream topping or warmed strawberry jam. Top first layer with whipped cream. Add the top layer or pound cake. Spread with whipped cream. Add more strawberries and drizzle with more strawberry topping. Chill or serve. You can make three loaves with this recipe. I freeze the other two for future use.